When zombies started rising, we expected the apocalypse. Instead we got pests. Zack is a redneck, metal head with a talent for zombie-splatting who showcase every second of gory mayhem on ViewTube. And his whole family gets in on the action. Overnight, Zack's exploits catapult him from viral video joke to primetime cable hero, but with fame comes a fall from grace. To make matters worse, an ancient evil rears its ugly head, threatening to bring forth a hellish undead apocalypse. Zack: he's humanity's only hope. We're screwed. 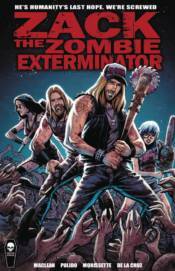 From the twisted minds of Brian Pulido (Evil Ernie, Chucky) and Mike Maclean (Sharktopus) comes the rise, fall, and redemption of an American original, Zack the Zombie Exterminator.